0407 - Luigi's Lament - Heroes Inc.Heroes Inc. This entry was posted in Story and tagged Luigi. Bookmark the permalink. Luigi most likely disguarded the hat to allow him not be constantly reminded of his brother and others…but as you can clearly see here, it isn’t working. He left his hat behind when he left Heroes inc.
Well, I officially hate Luigi’s hair. I think its time for him to hit the bottles. 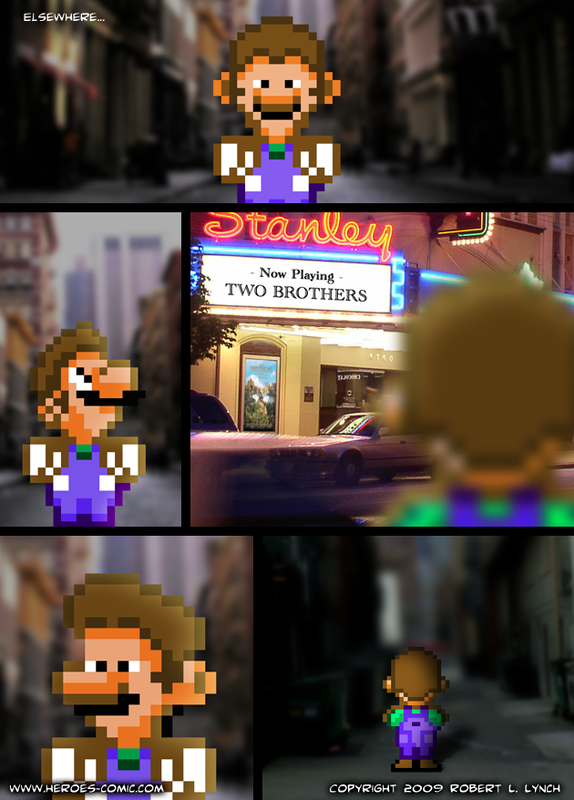 Don’t get back on the ‘shrooms, Luigi! Don’t! Also, I predict that luigi will be the one who saves them all in the end. he will turns evil 1st.. I think the whole “evil twin” thing is too cliche for Rob to use. But if he plans to and that was insulting, sorry. Spellca, you say the “evil twin” thing is too cliche, but isn’t the whole “Link is Chrono’s father” thing really cliche, too? By the way, I don’t think there is anything wrong with cliches, expecially since they are almost unavoidable. ZeldaX: So, basically, Final Fantasy II?